Gimme More Photos > Get it !!! I went to a floorball match some days a go in a gymnasium close to the harbour. Floorball (called Innebandy in swedish) is very popular in Sweden and we had a small tournament within the company. This match was the final game and both teams were very motivated and of a good level. It was my first time shooting indoor sport and it was pretty tough. First, light in a gymnasium is very LOW. Therefore, I had to push up ISOs in order to get decent shutter speed. 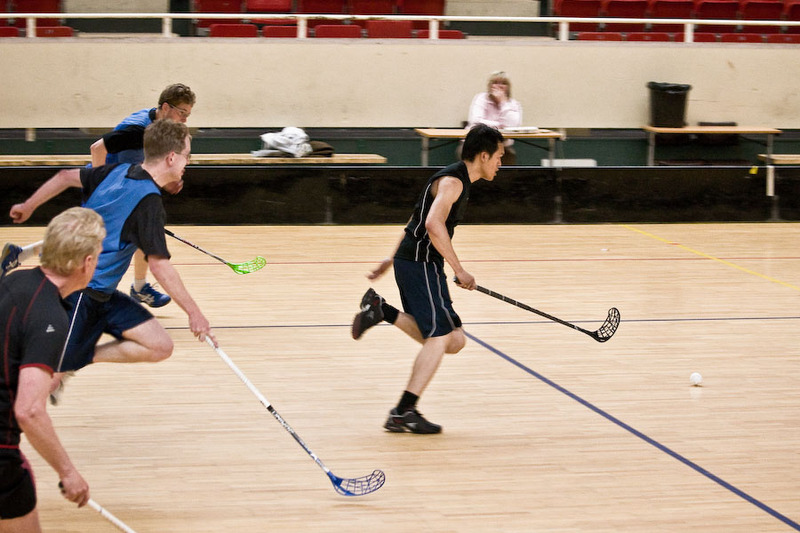 Second, Floorball is a fast sport, very FAST. So even with a decent shutter speed (around 1/250) it is pretty hard to get some sharpness out of the players. Third, floorball is extremely FAST, so there is nearly no way to catch the tiny plastic ball in action. I ended up with most of the pics having actions but no ball in the frame (but this one). Well, now I have full amiration for professional photographers that shoot handball games and other fast indoor sports for the morning papers. That is very hard work.